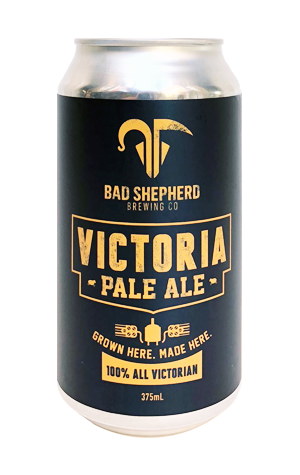 They've already got the Reserve Road Draught in their lineup as a nod to their locale and now the team at Bad Shepherd has come up with a new beer that cements their position as proud Victorians. The Victoria Pale Ale, packed in cans featuring the state's navy blue livery and the slogan: "GROWN HERE MADE HERE", is brewed with malt from Barrett Burston in Geelong, Vic Secret and Topaz hops from Hop Product Australia’s Rostrevor farm in the High Country and water from Melbourne. But where it really has a point of difference is in its choice of yeast. The beer is fermented with Melbourne Ale Yeast, which dates from the late 19th century and was only recently brought back to life from a yeast bank in the UK by White Labs in the US. You can read the full story here or just pick up a can and see what it does to the beer. Victoria Pale Ale is described as a summer ale, one in which the hops deliver light stone fruit aromas and a pinch of resinous fruity hop flavour as well as an old school, earthy bitterness. The malt bill has been kept simple and there's a hint of fruitiness from the yeast too, all coming together to create a beer that in character is perhaps even more locals-appropriate than the pilsner bearing the Reserve Road Draught name.